Multiple organizations have collaborated to update the social work technology standards of 2005. Representatives from those organizations discuss why the standards needed revision. Social workers are well aware of the challenges they're facing and have been reaching out to all four of the collaborating organizations for direction. 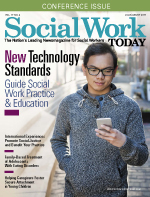 Mary Jo Monahan, MSW, LCSW, CEO of ASWB, says, "[The organizations] have been receiving requests for guidance in the use of technology in social work practice, in social work education, and in the conduct of safe, competent, and ethical practice for licensed social workers." Laura W. Groshong, LICSW, director of policy and practice at CSWA, also highlights the fact that social workers have been actively seeking input to address their concerns regarding the appropriate use of technology in multiple areas. "There's been an overwhelming request from social workers for guidance," she says. "In developing the standards, we wanted to cover all the possible areas that technology intersects with social work practice." • Social Work Education and Supervision. Monahan describes the standards as being extremely important to the ongoing effectiveness of social work practice, and she points out that they're practical. "Each standard provides general guidance in how to use technology in a safe, competent, and ethical manner, and includes an 'interpretation' section offering suggestions for thinking through ethical concerns and the appropriate use of technology in various practice settings." She adds that the standards also inform employers and the public about the practice standards to which social workers should be holding themselves. There is widespread agreement that social media presents one of the more challenging areas that social workers are expected to navigate. It's a relatively new development, yet it is widely used for a variety of purposes and it continues to evolve. "Fifteen years ago, we didn't have Facebook," says Jo Ann Regan, PhD, MSW, vice president of education at CSWE. "Instant messaging was nowhere near as widespread as it is today. As new platforms with increased capabilities are developed, there's a need to determine how to use these tools in a practical sense, as well as where and how they fit into the bigger picture." Social media can seem like a dangerous minefield at times, and not only for social workers. Issues steadily arise even among segments of the population that one would expect to be tech-savvy and knowledgeable about appropriate communication practices. Given the nature of the duties social workers are engaged in, their involvement with vulnerable populations, and the trust they seek to establish with their clients, the need for expert guidance in how to navigate this terrain is extremely important. "I believe the area of social media has introduced new challenges," Monahan says, citing the proliferation of communication devices and techniques. "The standards clearly guide social workers to develop and adhere to social media policies in work settings, and particularly in private practice settings." As previously mentioned, one of the sections in the updated standards document addresses gathering, managing, and storing information, an area of critical importance within social work practice. On one hand, the ability to exchange and manage information electronically affords an increased level of ease, flexibility, and convenience. "Technology appears to have made work easier for social workers," Coleman says. "The filing system is simple. Work is accessible 24 hours a day, making telecommuting an important part of the workforce. It is easy to submit electronic claims, patients are accessible and easy to contact, services can be rendered from any location, and the internet provides a wealth of information and resources within minutes." But whether it's online communication or electronic recordkeeping, there are also a number of associated risks. Devices containing sensitive information can be lost or stolen. Systems can be hacked and private information can be accessed. In the case of a ransomware attack, important files can be encrypted and thus rendered inaccessible—a costly problem if the files haven't been backed up. And while having the flexibility to work from any setting can be extremely useful, it brings unique risks, e.g., privacy and security issues when exchanging sensitive information using public Wi-Fi. Coleman cautions that social workers and their organizations must pay special attention to safeguarding and securing patient information. "Social workers aren't necessarily trained in security, privacy, and all the ramifications when delivering services and working online," Regan says. "The standards will help to foster a greater knowledge and understanding when moving to a digital environment." All of the parties involved with developing the standards believed that this area was an important one and needed to be addressed thoroughly in order to reflect the current realities of information management. "Recordkeeping is primarily done electronically now," Groshong says, "and we felt this is an area that has received much less attention than it needs." The addition of the education section to the updated standards is particularly noteworthy, as this directly reflects technology's far-reaching impact. "Social work education is in the process of a monumental shift," Groshong says, "from in-person education to distance education and online delivery. We wanted to have some standards in there regarding how that should look." As this shift takes place, new opportunities are emerging to better meet the needs of social work students. Coleman believes the use of technology in social work education has the potential to enhance several aspects of the learning experience. She says, "Technology is an important part of social work education. It enhances access, skill development, student engagement, and learning outcomes for all levels of education including formal education, field instruction, continuing education, supervision, and organization-based education." But these benefits aren't automatic or guaranteed; a concerted effort needs to be made to identify where and how technology fits in. "There's a need for educators to be thinking about how they deliver education programs," Regan says, "and how technology can be used to further enhance the learning experience." She explains that a hybrid approach to education delivery is especially well suited to the needs of social work training. "Skills-based training would be in-person, whereas knowledge-based elements could be delivered online." The inclusion of technology in this type of hybrid approach to education delivery has widespread support. "There's definitely a place for technology in social work education," Groshong says. "There are many areas of social work practice such as policy, advocacy, and research, where it's totally appropriate." When teaching clinical skills, on the other hand, in-person contact becomes more important. "Our view is that until people know how to sit in a room with a client, they might not have the ability to be effective clinicians through technology alone." Groshong continues, "The younger generation training to become social workers today has grown up in the technology world, so it's normal to them to do everything online." For this group, communication and contact through technology can even become a preference. "We see social workers as the guardians of the human connection, and our concern is that this could be lost if there isn't direct in-person contact." According to Monahan, technology has greatly influenced social work education by broadening its reach, resulting in enhanced access. "Students are able to take courses in flexible formats that suit their lifestyles and study styles," she explains, "such as online courses, podcasts, prerecorded lectures posted on internet-based course sites, online practice simulations, and interaction with fellow students around the world." In order for technology's educational benefits to be fully realized, relevant competencies are required on the part of the educators. As Monahan says, "Social work educators and providers of continuing education and supervision should develop competence in the ethical use of technology, keep current with emerging knowledge related to the delivery of technology-mediated education, and conduct research on the use of technology." Monahan continues, "Educators should employ instructional strategies that allow students/practitioners to apply technology knowledge and skills in their beginning practice, and model, guide, and encourage legal, ethical, and safe behavior related to the use of technology." She also points out the need for educators to teach students/practitioners how to think critically about the potential benefits and risks in using technology. Given the pace at which technology continues to change and evolve, the ability to think critically in this regard is of paramount importance. In all fields, the successful use of technology goes beyond core technical skills; it requires discernment and good judgment. It also requires adaptability and the ability to continue learning on an ongoing basis, in order to keep up with all of the changes and new issues arising. As Monahan says, "Ultimately, it is the responsibility of the individual social worker, whether licensed or unlicensed, to manage their own practice and professional development throughout their professional lifetime." Social work isn't the only field to be impacted by the growing use of technology. It would be difficult to find any field or profession that has been completely unaffected by technology-related challenges, not to mention technology's impact within people's personal lives and relationships. There's no question, however, that the nature of social work leads to some unique and additional challenges, and in some cases, greater risks. "With the increasing use of technology and all the tools available, we've seen the development of new types of interventions," Regan says. She cites the advancement of online counseling as a prime example; practice has been going on, but with no clear guidelines. "The standards provide an increased awareness of the issues that can come up in this context, and how to deal with those issues effectively." The information that social workers collect on their clients is typically private and often quite sensitive. Adequate steps need to be taken to ensure that information stored electronically is also stored safely, to reduce the risk of access by unauthorized individuals. While information sharing between programs and organizations via electronic means can help to improve the overall quality of care that people receive, workers need to be mindful of consent issues with their clients. There are also unique challenges associated with communication and service delivery across state lines. Coleman notes, "In general, social workers are unable to provide services across state lines unless they are licensed where the client is located at the time of services." She points out that this can be problematic for those social workers who provide services within tri-state jurisdictions. Given all the ways in which technology is impacting and shaping social work education and practice, there's no question that the updated set of technology standards will be very much welcomed. "Currently," Groshong says, "there's no other document as detailed and comprehensive, so these guidelines will become the standard across the country." For younger social workers and "digital natives" who have been immersed in technology for most of their lives, some aspects of the content will be somewhat familiar. But the breadth and depth of the document ensures that everyone will benefit from it, regardless of age and level of technical expertise. "Everyone will learn how to use technology ethically so you don't violate standards of practice," Groshong says. "This is going to help protect social workers." It's also important to note how technology and the updated standards fit within a larger societal context. As Monahan observes, it's not just technology that's changing; there have also been changes in our social, political, environmental, economic, and religious environments. Technology presents a number of new issues and challenges on its own; combined with changes in these other areas, the situation becomes even more complex. The new standards serve as an additional tool to assist social workers in navigating this terrain, regardless of the capacity in which they're working. "These standards," Monahan says, "serve as a guide for professional social workers to use in their practice, and, similar to the Code of Ethics, the standards are relevant to all social workers and students, regardless of where they work, the clients they serve, or their particular professional job functions." In spite of all the changes in technology and the new issues arising, the core concerns at the heart of the matter remain unchanged. The central question that always needs to be asked is, how can these tools can be used in a way that maximizes their effectiveness in meeting clients' needs, while minimizing the risk of harm to both the client and the social worker? In short, how can these tools be used effectively and ethically? As Regan concludes, "It's a rapidly changing landscape, and we're in store for many more changes in the future. We have to make sure we're using technology not just for technology's sake, but for improving clients' lives and improving student learning outcomes."